Adult opossums (or possums for us southern folk!) can be the size of a large cat. They have long, light gray hair, a pink pointed nose, with a scaly tail which is about half the length of its body. They can grow to 2.5 ft, and weigh around 8 - 13 pounds. 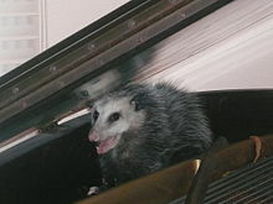 The average lifespan of an opossum is typically 2 to 4 years, since it is killed by many predators such as humans (cars), dogs, cats, owls, and larger wildlife. Opossums are nocturnal and prefer to live in an established home and pre-made structures, such as hollow logs, garages, underneath buildings, and inside burrows. They choose a location to live that is close to a food source so it requires less traveling and searching, because they are slow moving creatures. Since they are excellent tree climbers, they typically spend most of their times in tree holes, or dens made by other animals. Opossums are omnivores, meaning they eat meats, fruits, and mammals. Opossums are famous for "playing possum". When they feel threatened, they will fall onto their sides and lie on the ground with their eyes closed or staring fixedly into space. They even extend their tongues and try to appear to be dead so the threat source will disappear. This tactic may put a predator off its guard, allowing the opossum an opportunity to make its escape. 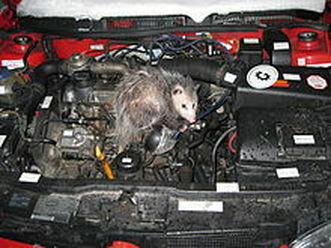 Unfortunately for the possum this does not work so well on cars and that's why you see so many possums in the road. Even though they can look threatening when baring their teeth and hissing, the opossums are usually docile. It is quite rare when an opossums attack and they only do so when they have to defend themselves. In order to avoid confrontation, the opossums will enter a "play-dead" trance. 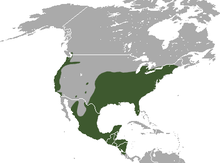 Rabies are commonly associated with opossums, however it is extremely rare that an opossum will have rabies. This is mainly due to the fact that it has a low body temperature, making it difficult for the virus to survive in an opossum's body. Most homeowners notice opossums around their garbage cans or even in the attics. Since these mammals are scavengers, they often raid garbage cans, dumpsters, and other various outside containers. Even though they eat nuts and fruits, opossums will also hunt mice, birds, snakes, and even chickens. Opossums are known to damage lawns, since they dig around for grubs in search of food too. The best way to keep them from messing up the garbage can is to have a tighter seal around the can. Always contact your pest control professional for an evaluation and the next steps to take for an opossums infestation. We can safely and humanly relocate your little intruder to a place he will not cause any damage to your property. To learn about Raccoons, click here!